I vow that as long as there is a single Bodhisattva in the three periods of time throughout the ten directions of the Dharma Realm, to the very ends of space, who has not realized Buddhahood, I too will not attain the right enlightenment. I vow that as long as there is a single Pratyekabuddha in the three periods of time throughout the ten directions of the Dharma Realm, to the very ends of space, who has not realized Buddhahood, I too will not attain the right enlightenment. I vow that as long as there is a single sravaka in the three periods of time throughout the ten directions of the Dharma Realm, to the very ends of space, who has not realized Buddhahood, I too will not attain the right enlightenment. I vow that as long as there is a single god in the Three Realms who has not realized Buddhahood, I too will not attatin the right enlightenment. I vow that as long as there is a single human being in the worlds of the ten directions who has not realized Buddhahood, I too will not attain the right enlightenment. I vow that as long as there is a single asura who has not realized Buddhahood, I too will not attain the right enlightenment. I vow that as long as there is a single animal who has not realized Buddhahood, I too will not attain the right enlightenment. I vow that as long as there is a single hungry ghost who has not realized Buddhahood, I too will not attain the right enlightenment. I vow that as long as there is a single being in the hells who has not realized Buddhaood, I too will not attain the right enlightenment. I vow that as long as there is a single god, immortal, human, asura, air-bound or water-bound creature, animate creature or inanimate object, or a single dragon, beast, ghost, or spirit, and so forth, of the spiritual realm that has taken refuge with me and has not realized Buddhahood, I too will not attain the right enlightenment. I vow to fully dedicate all blessings and bliss that I myself outght to receive and enjoy to all living beings of the Darma Realm. I vow to fully take upon myself all the sufferings and hardships of all the living beings in the Dharma Realm. 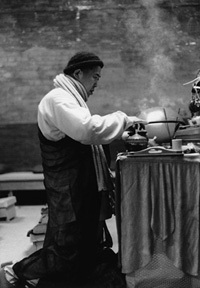 I vow to manifest innumerable bodies as a means to gain access into the minds of living beings throughout the universe who do not believe in the Buddhadharma, causing them to correct their faults and tend toward wholesmeness, repent of their errors and start anew, take refuge in the Triple Jewel, and ultimately realize Buddhahood. I vow that all living beings who see my face or even hear my name will bring forth the Bodhi resolve and quickly realize Buddhahood. I vow to respectfully observe the Buddha's instructions and cultivate the practice of eating only one meal per day. I vow to enlighten all sentient beings, universally responding to the multitudes of differing potentials. I vow to obtain the five eyes, the six spiritual powers, and the freedom of being able to fly in this very life. I vow that all of my vows will certainly be fulfilled.